This follows a cleanup of the sector by the Bank of Ghana. Many of the banks that previously operated in the country have folded up and taken over by other banks due to various new regulations introduced by the Central Bank including the GHS 400 million minimum capital requirement. In August 2017, the Bank of Ghana (BoG) gave GCB Bank Ltd the green light to acquire two local banks UT and Capital bank due to severe impairment of their capital. In August 2018, the Bank of Ghana consolidated five other local banks into what it calls the Consolidated Bank Ghana limited. The banks were Beige Bank, Construction bank, Royal bank, uniBank and Sovereign bank. Beyond have liquidity challenges, some of them were engaged in activities that the Bank of Ghana considered criminal. 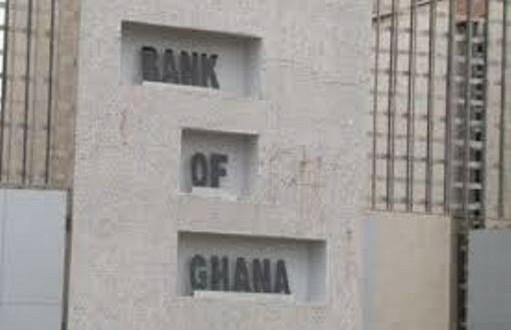 The bank of Ghana in a statement on January 4, 2019 following the expiration of the minimum capital requirement deadline said, all the 23 remaining banks have met the new minimum paid-up capital of GHC400 million. “Sixteen (16) banks have met the new minimum paid-up capital requirement of GH¢400 million mainly through capitalisation of income surplus and a fresh capital injection. The Bank of Ghana has approved three (3) applications for mergers. Consequently, First Atlantic Merchant Bank Limited and Energy Commercial Bank have merged, Omni Bank and Bank Sahel Sahara have merged, and First National Bank and GHL Bank have merged. 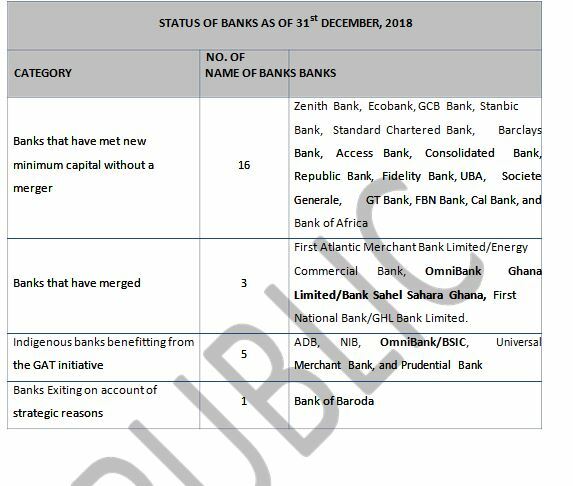 The three (3) resulting banks out of these mergers have all met the new minimum capital requirement. Some private pension funds in Ghana have injected fresh equity capital in five (5) indigenous banks through a special purpose holding company named Ghana Amalgamated Trust Limited (GAT). In addition to the state-owned banks (ADB, NIB) benefiting from the GAT scheme, the other beneficiary banks (the merged Omni/Bank Sahel Sahara, Universal Merchant Bank, and Prudential Bank) were selected by GAT on the basis of their solvent status and good corporate governance, the statement said. The Bank of Ghana further explained that it had revoked the licenses of Premium Bank and Heritage Bank and approved their takeover by Consolidated Bank Ghana Limited. It said in the case of Heritage Bank, the institution had questionable sources capital. Meanwhile, GN Bank has been downgraded into a savings and loans company following its inability to meet the minimum capital requirement.